Yvon Chouinard, founder of Patagonia, said “without a healthy environment there are no shareholders, no employees, no customers and no business.” A brilliant comprehension. Scanning tweets after our president pulled the USA out of the Climate Accord, I see many significant and large businesses stating their re-commitment to climate goals. I see stats about renewable energy, reminding us of what we have seen in development over the last 10-20 years: job creation in fossil fuel and nuclear is about five jobs per million in investment, while renewable energy investment creates 13.5 jobs per million. (Per 12/16 report from the World Bank). 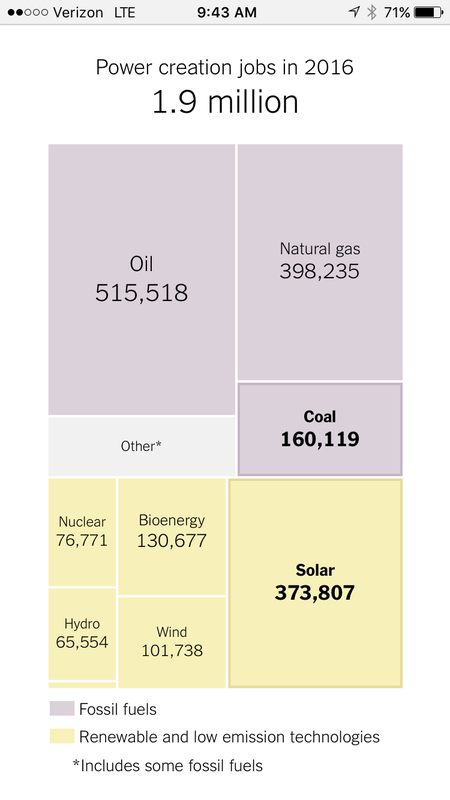 Note the included graphic from NY Times where they illustrate the number of USA jobs tied to different energy fields. Solar has more jobs already than coal, yet all renewable energy covered only 10% of USA energy production in 2016. The infamous Keystone Pipeline, long touted as a huge job creator, will result in only 50 permanent jobs. We can look at recycling and see a similar business benefit – recycling creates seven times the jobs that land filling waste does. These stats illustrate benefits to greener choices even within their own silos. We are comparing two types of energy production, one with a life limit and damaging to the environment and the other potentially unlimited and with limited environmental damage, mostly in manufacture. We are comparing two types of waste management strategies, one a liner cycle with a dead-end of waste, and one that strives for a closed loop for a greater percentage of the materials in use. 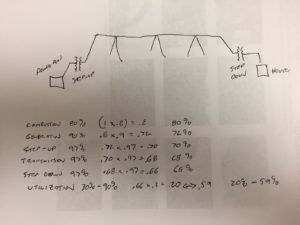 What if we break open our silos? I’m relying on The Solutions Project for an illustrative example. If you review the infographic 100_New York you can see a report for New York state assessing opportunities and investment needs. The site at www.thesolutionsproject.org has similar infographics depicting the compelling opportunities for each state in the USA and for each county of the world. Certainly in order to move toward these goals we do need the political will and active clearing of disincentives. We can pull some great and inspiring information from this site, perhaps to open discussion or even to move political will, at least at the state level. 39% reduction in energy demand out of the gate. The reason? RE can be distributed in production and located closer to use, which vastly reduces losses in transmission. 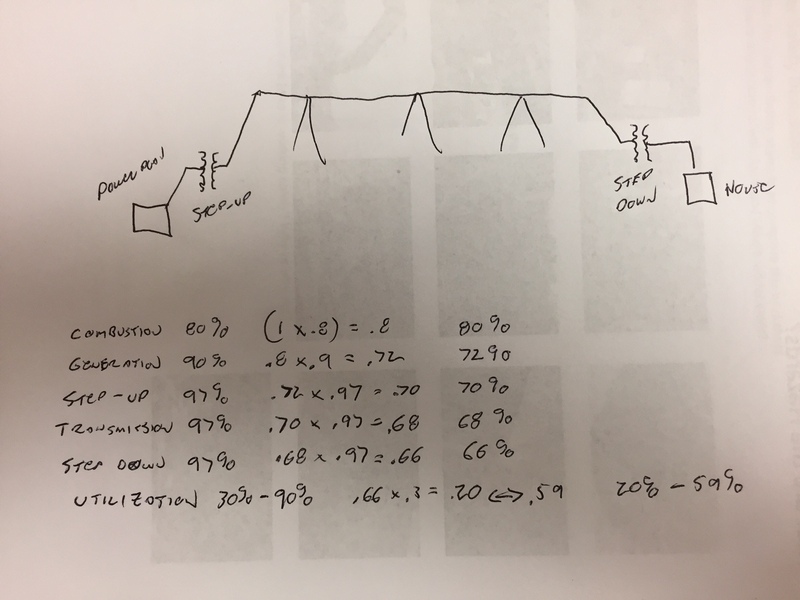 The sketch to the right is from a colleague of mine to illustrate this potential. Thank you, Bob Dooley. The transition to 100% renewable energy will create 4.1 million jobs and each of these counts as a durable job with a career path, lasting 40 years. We will save over 45,000 lives each year by eliminating deaths due to air pollution directly caused by burning fossil fuels. You’ve likely seen billboards recently about how smoking causes 16 kinds of cancer. FF emissions contribute to cancer, lung diseases, reduced developmental gains in children, asthma, etc., each of which has expensive health care burdens carried by the individual, the community though insurance costs, and the health structures in readiness costs. Over $10,000 savings per person, per year. These are savings tied to reductions in fuel costs and health care costs. These health care savings are even more important in light of 24 million Americans expected to lose their coverage under projected “new” federal health plan that will supposedly replace Obamacare. 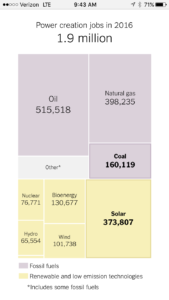 The key with all of this is to understand it feels like overall job loss until you look outside the fossil fuel industry to see the gains in jobs in renewable energy systems. It looks like investment that will take many years to pay back, until you realize there will be incredible benefits gained in healthcare spending in the insurance and personal realms. 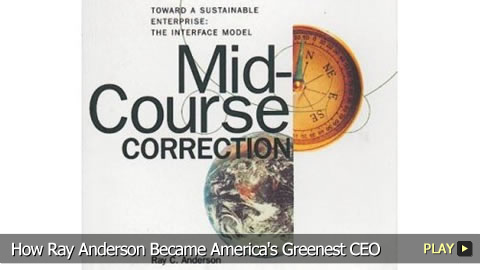 It resonates as a restriction or burden to business in general, unless you look at the opportunity of closed loop cycles where you can recapture the industry inputs to re-engineer them into your processes, as Interface has done (read Mid-course Correction by Ray Anderson). Until you realize that step one is eliminating waste, which can only benefit your cost-to-product ratio. Until you realize that embracing the opportunities in innovation may well be cheaper than defending the status quo, and better position your business for the future we are rushing into. It is easier to do what you know. Understanding how change can create benefits throughout the full spectrum of affected entities is a needed first step to help us not only “deal with climate change” but improve business practices, support better health, and function as stewards of resources we will need for a long time to come. And it increases our long-term business success. Period. Without a healthy environment, we have no opportunities.